Aftermath is a unique experience in immersion events. Based in a “Mad Max” style post-apocalyptic world, Aftermath is meant to entertain and educate while staying open enough for you to create your own experience. Features include live music, a post-apocalyptic and rat rod car show, classes and workshops, a market for bartering and trading post-apocalyptic goods, and much more. 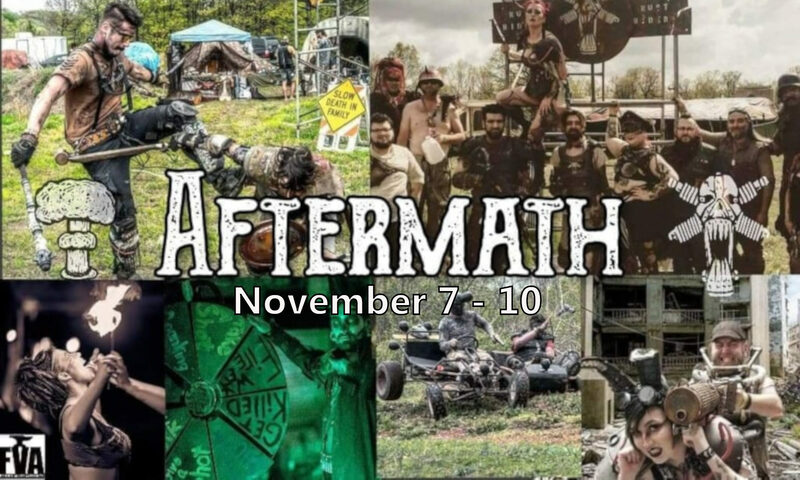 Aftermath will be held from November 7th through the 10th, so you’ll need to bring your own camping gear, costumes, water, and other supplies you might bring on a normal camping trip. You can bring your own camp food but there will be a food vendor, also. Portable toilets will be stationed as well. Please see our FAQ and Rules pages for more info.